We have the most stains in our clothes at our house so I have plenty of cleaning tips for you. I absolutely do not enjoy having to remove stains but someone has to do it. Since we live on a farm and my husband works construction, it’s either grease or manure. Over the years I have gotten pretty good at getting grease out of jeans, shirts and whatever else it lands on. 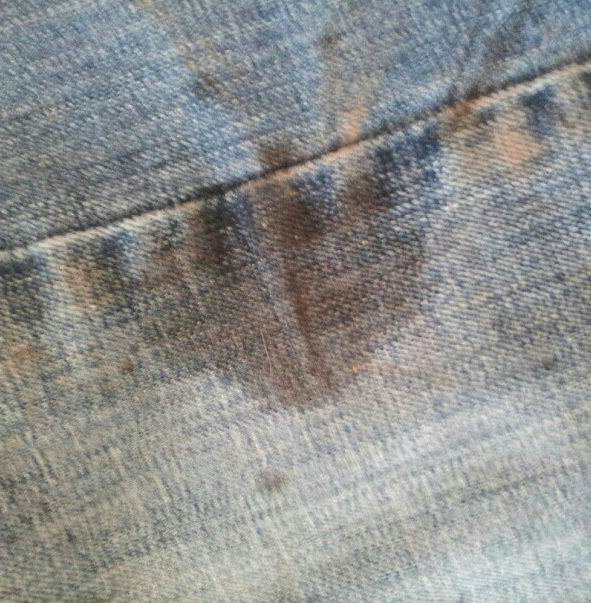 My husband came home last night from working on construction equipment and had grease all over his jeans. So, I thought it would be the perfect time to try out my new 20 Mule Team Borax I received as being a part of the Purex Insiders group. I use Goop Hand Cleaner by the tub for everything. Our hands. Our clothes. Around the house cleaning. You name it, it’s probably been gooped at least once! I had already rubbed in my Goop before I thought to use the 20 Mule Team Borax. The Goop doesn’t always get all of the grease stain out so I was excited to use something else to see how it worked. 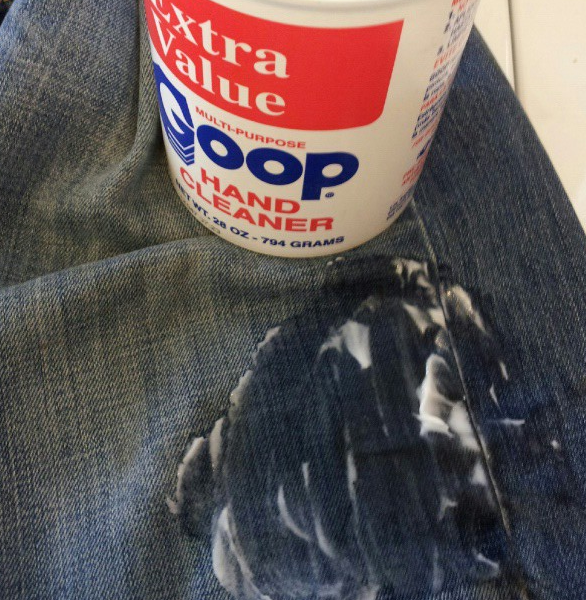 I rubbed the Goop into the jeans and rubbed it together. I had already let it set for 30 minutes or so. I threw the jeans in the washer, added my detergent, and about a 1/2 Cup of Borax. I filled the washer up with warm water and let it soak for about an hour. I wanted to make sure it really had time to pre-soak and work out the stains. 20 Mule Team Borax is 100% natural mineral from the Earth and pure. We have hard water. Hard water contains calcium and magnesium (ions). 20 Mule Team Borax actually naturally softens your hard water, which in turn protects your detergent. It maximizes cleaning power while saving you money on detergent. It simply improves your detergent’s cleaning power and helps keep stains from being re-deposited back onto clothes. Borax boosts your detergent. Simply add 1/2 cup of 20 Mule Team Borax to every load, along with your regular detergent. The jeans I mentioned above had multiple stains of grease all over them. I have to say I am quite surprised but they came out grease and stain free! 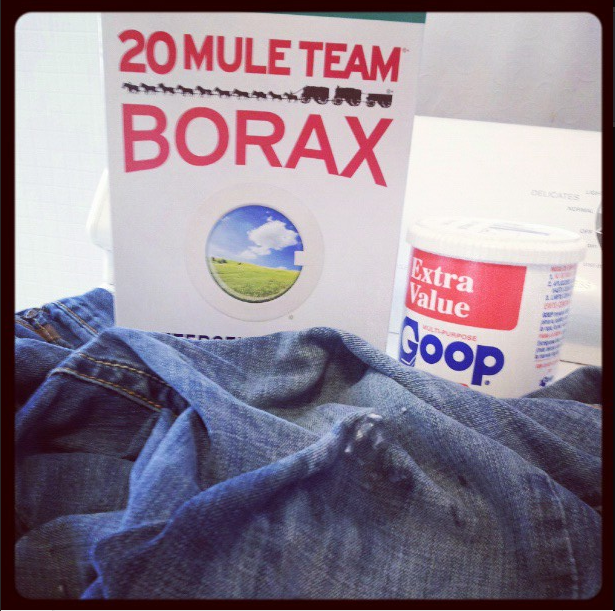 We give 20 Mule Team Borax an A+! I’ll be using it in all my loads of laundry even if I don’t have stains. It’s a great way to soften our hard water. Want to win a FREE box of 20 Mule Team Borax? We’re giving away 3 coupons good for a FREE box! Enter to win! I always use borax in my laundry. It is part of the recipe for homemade laundry detergent. It does a really great job of getting my clothes clean. I have never used Borax before and I would love to try it here to see if it works as good on some of my stains. Love Borax….forgot about getting grease stain out with it. Borax is also good for when you have to clean furniture….my gram was a smoker and YEARS/DECADES of TAR discolored the furniture….I came off with Borax-AMAZING! I didn’t know that Borax is also a household cleaner. My mom always taught me to use borax to boost my laundry and get my clothes cleaner, but never really said much about stains… good to know it can get them out. It’s also a great way to get rid of ants, without using pesticides. I use borax in my laundry soap! It works great for stains and grease! Great review! I’ve used borax for 3 years or more in every load of laundry. I had hard water also in my last house so I feel for you. I hated how it smelled and my detergent didn’t seem to suds very well, when I learned about borax (thanks to my lovely mommy 😀 she’s so smart)I was thrilled at how much cleaner my clothes were. I like borax a lot. It always seemed to give our deteregent that extra bit, looks like it worked well for you too! That sounds good. Borax has been around for years, but I’ve never used it. I’ll have to try it. Thanks for the info! I will start to use this with my laudry soap for my mechanic hubbie’s tough stains! It helps keep stains from being re-deposited back onto clothes. I love this post! I have to bookmark this. I am going to be using Borax to make my own detergent. Will add this too! I have used Borax in the past, but not so recently. I am glad that your post came to my attention so that I can try again. That is amazing! Thanks so much for such an informative post. I remember borax being in the laundry room when I was a kid, but I haven’t used it as an adult & mom… sounds like I’ll be trying it myself though. Very nicely written review and your “voice” or style of writing is enjoyable. I’ve been married 55 years and that is a lot of laundry out of the tub. I raised 5 kids, too. I had heard of Borax but never used it except as an additive in the diaper pail. I remember trying something called Pine gel that came in a can and it was suppose to boost the cleaning of the detergents we used. I’m not so sure it did and it added that pine scent. However, since I hung the clothes outside to dry, the pine scent dissipated before bringing them in. I will be trying Borax even though I don’t have the tough stains and dirt you deal with. I use Borax and I agree it definitely works on greasy stains. Thank You for the review, I am going to pick up some goop to use along with the Borax. I’ll have to try your method on my clothes. I always seem to get grease splashes from cooking no matter how careful I try to be. Borax and Tide are the best combination for getting clothes clean!! Borax is great. I use it to make my own laundry soap. It saves me money. Thanks Borax ! I’ve never tried this before.. lots of kids lots of stains! Wow, thanks for the great info !! !